The Partagas Serie D No.5 is a strong yet smooth medium-full Petit Robusto, 4’3” (110mm) long, of 50 ring gauge, and comes in a box of 10 cigars. First released as a Limited Edition in 2008 and due to its immense success and popularity as an Edicion Limitada, it was later also released as a regular production cigar. All the flavors of a Partagas Serie D No.4 are condensed in this smaller vitola, 110mm x 50 ring gauge, which makes it a go-to cigar for the Partagas Serie D No.4 lovers who are looking for a quick smoke and still enjoy all its taste. This is a full bodied smoke, and is very enjoyable, smoother than the Serie D No.4. • It is complex in its flavor profile and would be a great cigar for anyone. • The aroma and flavor are well balanced and highly enjoyable. This cigar is what a great Cuban cigar is all about. If you are lucky enough to get your hands on some of these, enjoy them! This cigar is well presented and has a spongy feel to it, with no bumps or ridges. 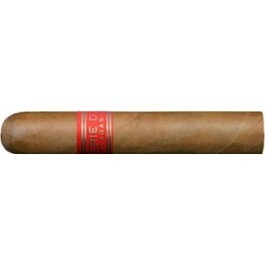 The cigar is well constructed and has a consistent feel to it head to foot. The cigar has a light brown color to it and shows no veins, and no seams and a very oily slippery looking wrapper. The aroma of the cigar pre light is medium. You can smell the aroma of cedar, and oak. The construction on the cigar is top of the line, and this lends to a very even slow and even burn from foot to nub. The draw is impeccable. There is a tremendous amount of thick creamy smoke being produced with each puff from start to finish on this cigar. The first third is big on cedar, with some nice leather and oak notes. As you continue to smoke the cedar backs down a bit, and the flavors of a sweet salty cocoa, and a dark roasted coffee are introduced. In the middle you get more creamy vanilla with notes of caramel and smoke with some mild and smooth spice. Towards the end of this cigar the coffee and cedar are in the forefront. This cigar has a nice creamy thick (good) finish to it. You will be wanting to chew the last few puffs. In summary, there is a tremendous amount of thick creamy smoke being produced with each puff from start to finish on this cigar. Yummy, yummy.